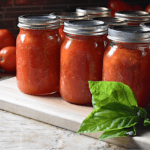 Home » How to » Canning Raw Pack Whole Tomatoes -a step by step guide. Canning Raw Pack Whole Tomatoes is my favorite way to bring back a little bit of summer during those long winter months. 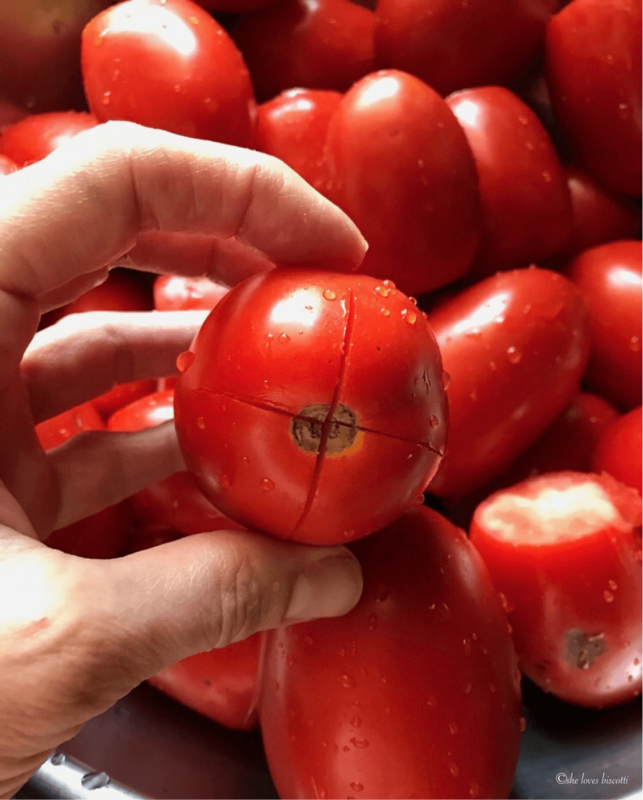 There is nothing quite like eating a freshly picked, sun ripened tomato. 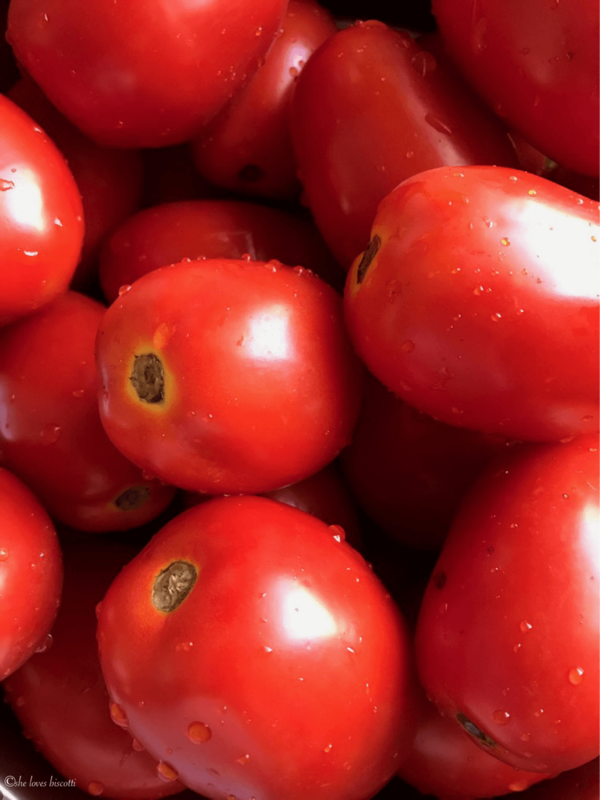 My family is privileged enough to have a small backyard garden and a good section of it is dedicated to a variety of tomato plants – cherry, heirloom, and of course, the thick flesh Roma tomato, which is the perfect tomato to make sauce with. Every year, there is this mad dash to maximize preservation of fruits and vegetables. It’s no wonder as everything in my garden ripens at once! It’s been a busy couple of weeks, from making Homemade Concord Grape Jelly, to Crock pot Vanilla Pear Butter, and some jars of Chunky Applesauce which will most likely end up as hostess gifts during the holiday season. So, in an effort to preserve some of my backyard Romas, I spent an afternoon Canning Raw Pack Whole Tomatoes. They will be used for those hearty stews and chunky minestrone soups, appropriate comfort food for the winter. I would like to spend just a few minutes and share this simple process with all of you. Before I get into the how to, I would just like to bring up a safety issue. As you probably know, when canning tomatoes (or any foods) the level of acidity will dictate the preservation method. Although tomatoes have always been considered a high acid food, they have recently been flagged as being borderline as far as the pH is concerned (source NCHFP). Remember, a certain level of acidity (pH below 4.6) is required in order to prevent food borne illnesses, botulism for one. So, like a good little canning soldier, I am following the recommendations. Just in case you are wondering, that means adding a tablespoon of concentrated lemon juice per pint of raw canned tomatoes; two tablespoons if you are using quarts. It is not recommended to use lemon juice (squeezed from a lemon) as lemons can vary in acidity. 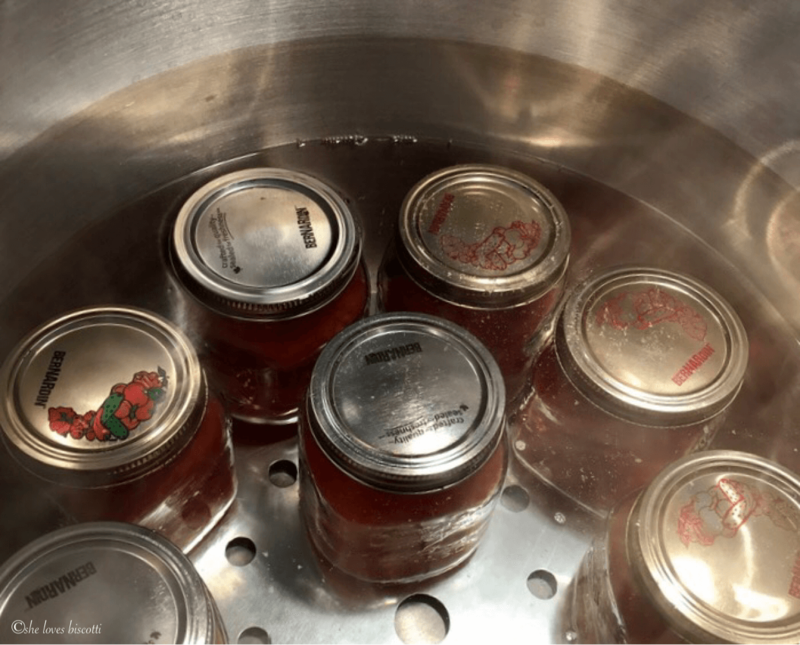 Canning Raw Pack Whole Tomatoes by using a water bath method is not difficult, but following a couple of essential steps makes the whole process a lot easier and safer. Tomatoes need to be washed. 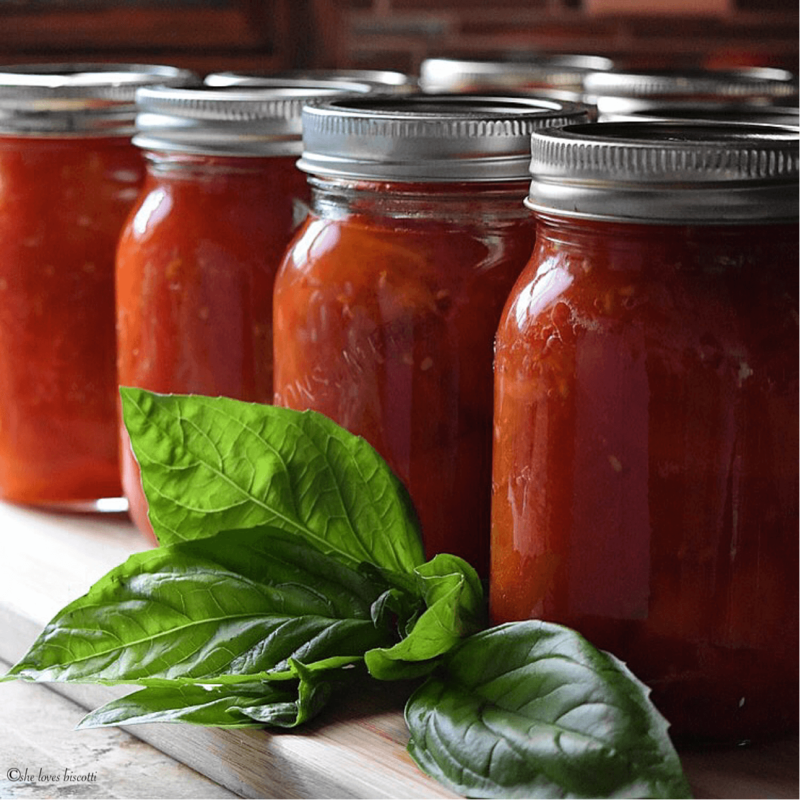 Although any tomatoes can be used, the plum varieties (Roma tomatoes) are the best when it comes to canning. Remember to use tomatoes that are blemish free. Place a sterilized lid and screw on the bands until “finger tight”. Place the sealed jars in a lukewarm water bath. Ensure the water is a couple of inches above the jars. Bring the water to a rolling boil and start the timing process. Please note that process times can vary based on your altitude. Please refer to this chart for recommendations. I will process my pint jars for about 85 minutes. GOOD TO KNOW: In order to prevent rough mineral deposits on the outside of your jars and on the inside of your water bath pot, pour about 1/2 cup of white vinegar in your water bath. Remove jars and allow to cool down before storing. You’re done! When you hear the seals of the jar lids popping, you’ll know you’ve done a good job! There was, of course, the obligatory visit to the farms to hand-pick a few more bushels of Roma tomatoes… just in case. You need to know that la cantina was one of the most important rooms in the house and it had to be well-stocked! And so it was, that as we washed and peeled and jarred tomatoes, stories of childhood memories and lessons of life were shared from one generation to another. I often look back at those days and think not only were we preserving tomatoes, but creating lifelong memories. 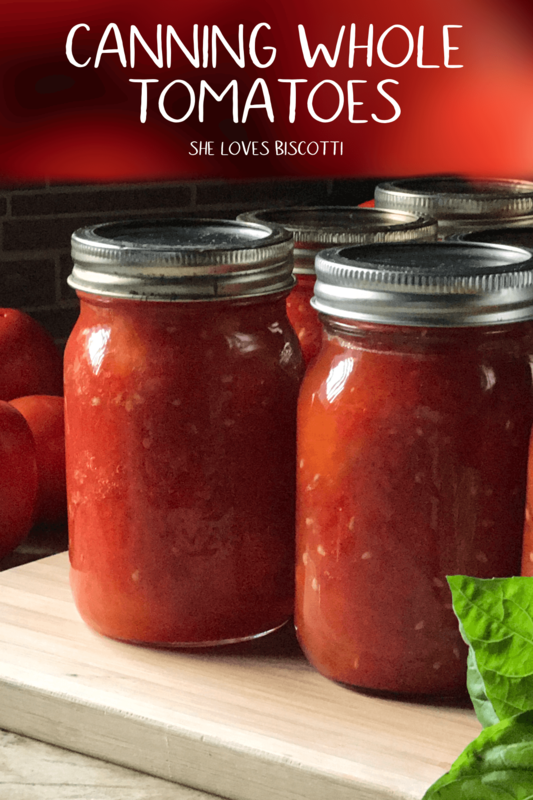 If you have made this canned tomato recipe, I would love to hear about it in the comments below and be sure to rate the recipe! Blanch the tomatoes by dropping them in a pot of boiling water for about 60 seconds. Remove tomatoes and place in a bowl to cool down (if you want, you can place them in an ice water bath). Peel off the skin when cool enough to handle. Add concentrated lemon juice to jars (2 tablespoons per quart or 1 tablespoon per pint). 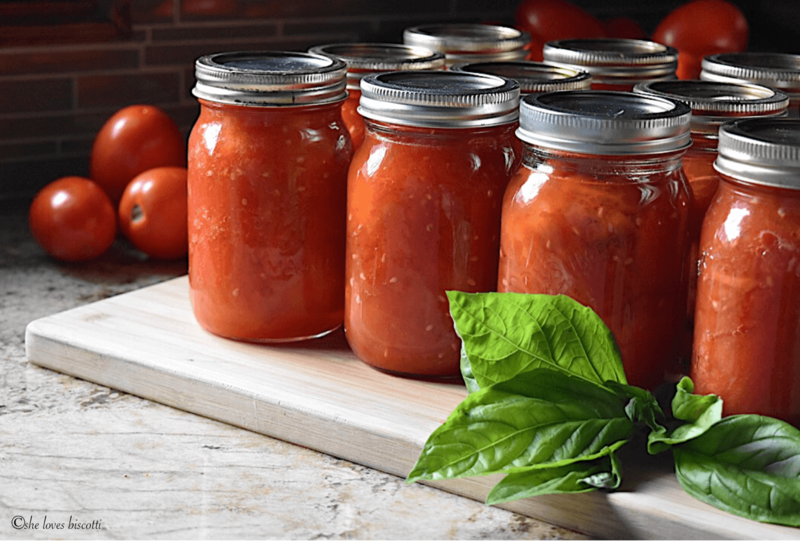 Fill each hot (sterilized) jar with peeled tomatoes and their juices. Leave 1/2 – 3/4 inch head-space from the top. Remove air bubbles by running a knife along the side of the jar. Process in hot water bath. Recommended process time for both pints and quarts is 85 minutes. Please note that process times can vary based on your altitude. You can process as many or as little Roma tomatoes as you wish. What is important is that you follow safety guidelines. IF YOU ENJOYED THIS HOW TO CAN TOMATOES POST, SAVE IT FOR LATER. Can fresh squeezed lemon juice work? I know you don’t mention it but should we be adding a little salt?oneteaspoon per quart as many recipes recommend or do you feel this is not necessary. We all try to avoid salt. Also how does the Lemmon juice and possibly salt get distributed amongst the packed tomatoes. Doing a bunch right now. I think I will lightly pack jars with tomato pieces then add Lemmon and salt . Proceeded by filling remainder of jar with tomato juice,cover then shake briskly. Followed by the water bath. Do you have any thoughts on this. Thanks! Hi Kevin, salt is optional. I like to add it when I open up the jars and use them in recipes. The concentrated lemon juice is added per jar as per guideline. Feel free to get back to me if you still have any concerns. Great questions. I was wondering if it would be okay to cut in half to seed the tomatoes? If so would that be done after blanching. I cannot have seeds in my diet so this would be helpful for soups and sauces. Thanks for this wonderful information Maria! Just pinned this for next summers tomatoes! Who knew canning them was so easy?! Maria, like you I have so many memories of my aunt’s annual ritual, in the basement of her New Jersey home, Those tomatoes took us through to the next summer and I can still see the jars line up on her shelf. Thank you Jovina ♥♥♥ Have a great week-end… it’s going to be a hot one!